That's the thing about mites. You have a few mites (hard to detect), and for a long time it's not a problem. 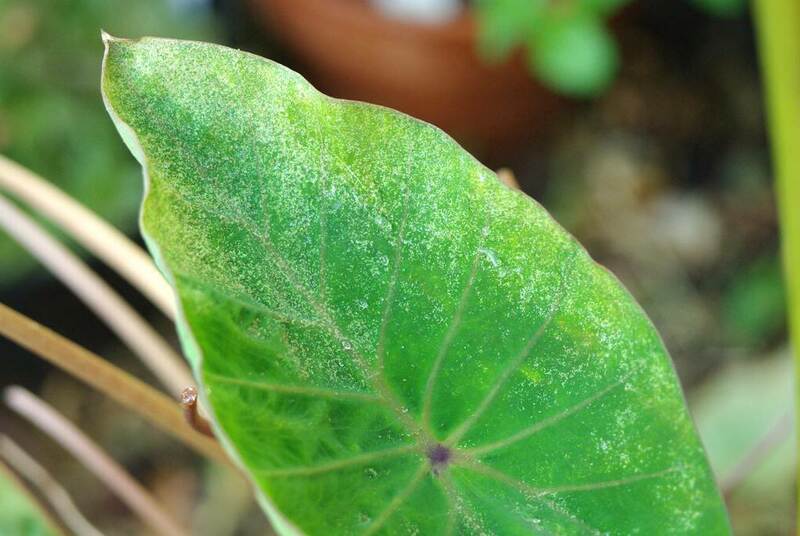 A little speckling on one leaf. Then a little speckling on a few leaves. Still just a little speckling. More time passes and still not really a problem. At least that's how it goes with me, because I never take steps when it's still just a little bit of mite damage. 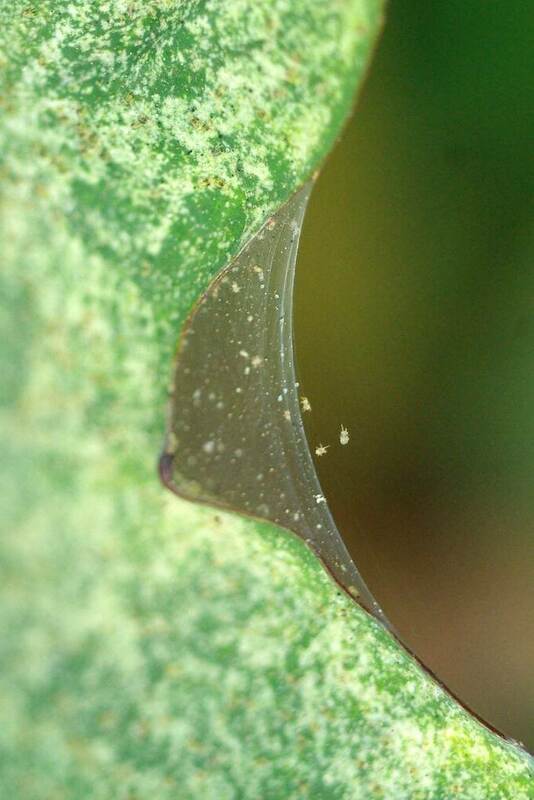 That's a good look at the webbing that gives a spider mite its name. Then I applied a systemic pesticide in a soil drench (no spraying of nastiness in my garden!) I normally wouldn't do that, but for mites I attack with the big guns. I will spray with insecticidal soap too, but I don't think I can rely on that exclusively in this case. I also use the same systemic when dealing with mites on my bamboos, but that's a bigger battle at least for the in-ground bamboos. Hopefully this takes care of the issue on this plant. 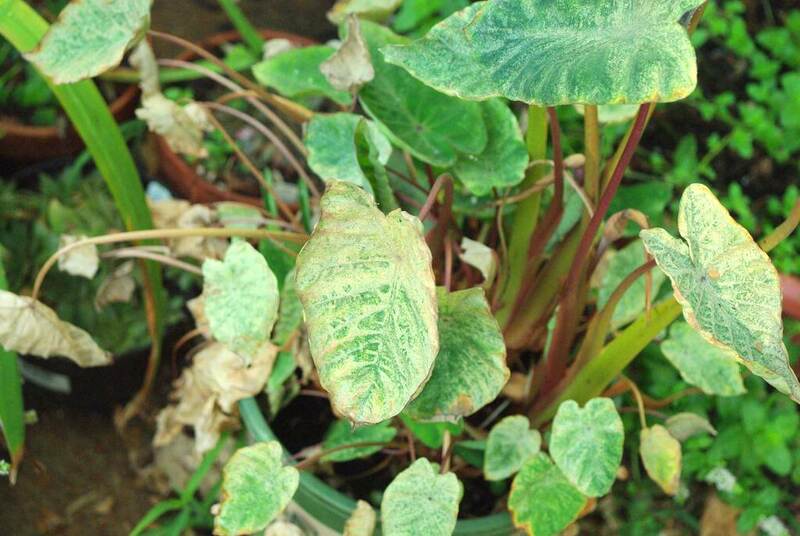 I have some small "pups" that I took from this plant a month or two ago and they have the same issue with mites, so either they were already infested, or this plant is very susceptible to them. 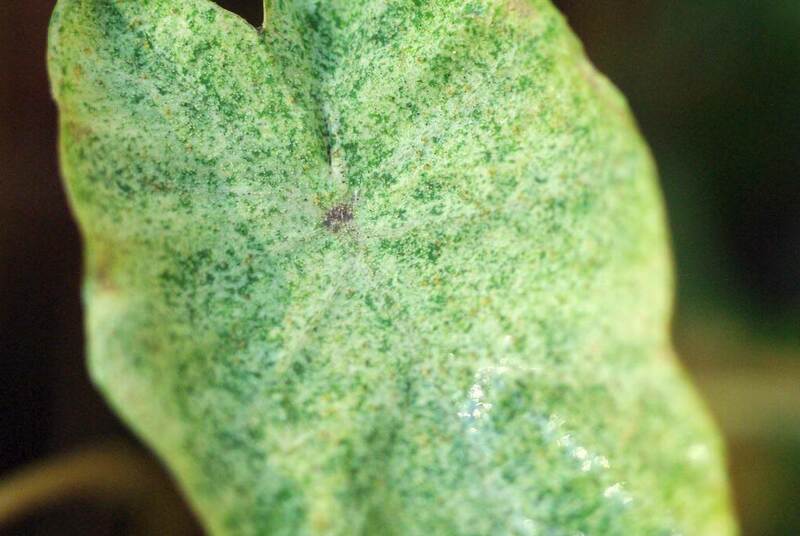 Spider mites. 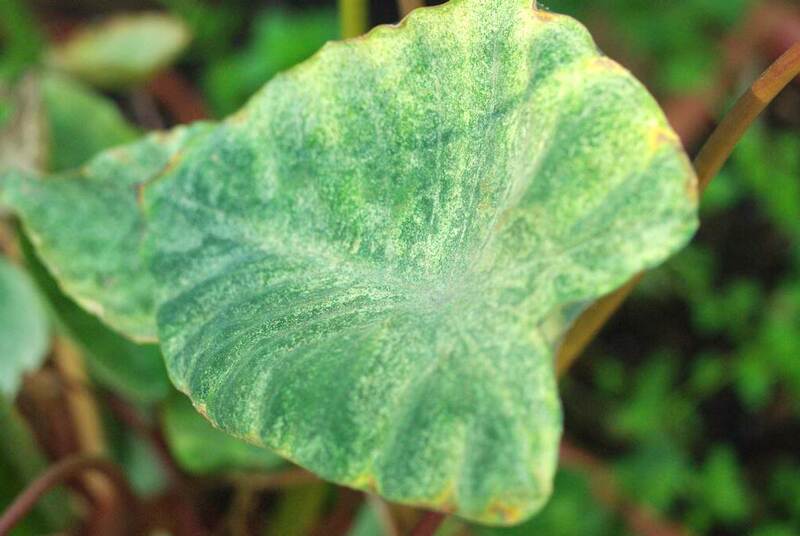 One of the smallest pests can wreak so much havoc on even the largest-leaved plants. I hope they're not a problem in your garden! 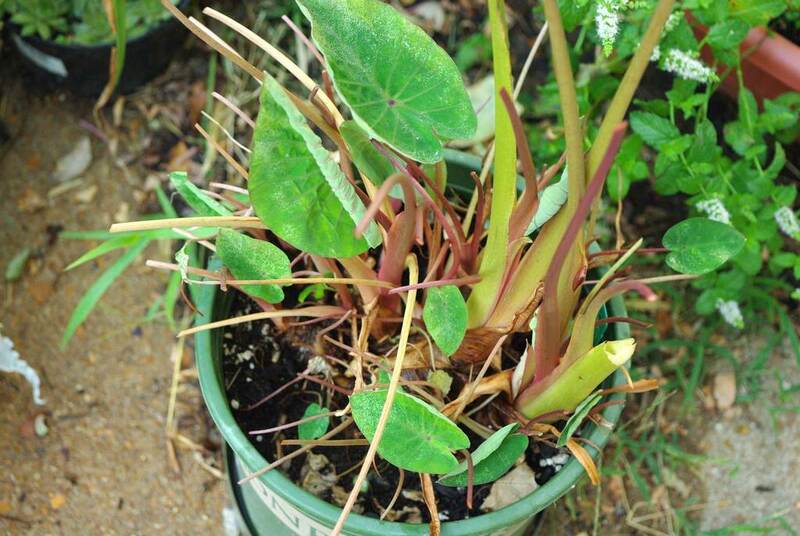 Initially I have the same problem with my Alocasia. As observed by you, it will become a big problem if not handled in time. Whenever I come across any slight speckling, I sponge it down with soapy solution (dish washing liquid. While watering this plant, I always spray on the underside to dislodge any mites. I think I can safely say that my Alocasias are now mite-free (keeping fingers crossed). 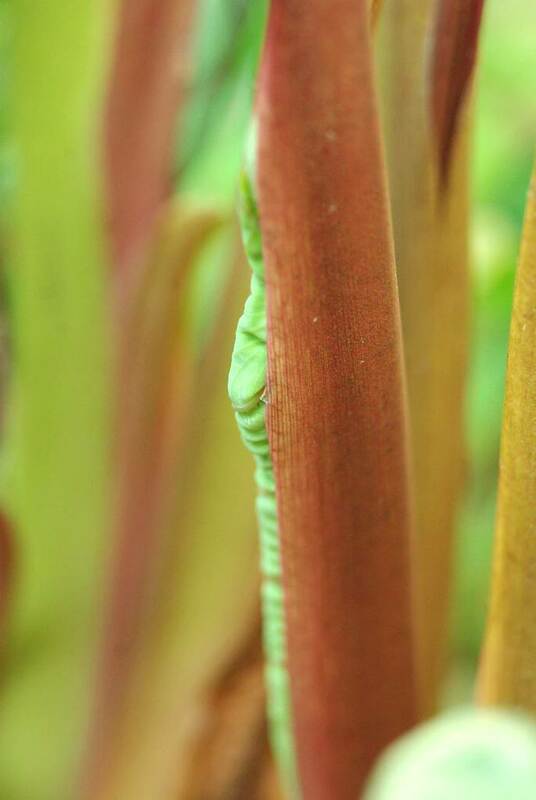 I had a bad breakout last winter, when all of my Colocasia (and one Alocasia) were pulled into the basement...in fact I didn't get on it fast enough and lost a couple of plants entirely. Never again! Sorry I'm a couple years late to the post but glad I found it. I live in an arid climate and love elephant ears but the two just don't seem to go well together and it's very frustrating. I've tried repeatedly to grow them and have run into two problems - dry heat and spider mites. I tried repeatedly to get rid of the mites and they just kept coming back. I didn't use a systemic on them and wonder if that would work on them. Can't do much about the dry heat outside when growing them out there.